You Will Be Opening Your 'Impossible to Move' Sliding Door with One Finger, Guaranteed. Does this describe your sliding door problem? If you are struggling to open your door, then we have a cost-effective solution to get you back on track (pardon the pun). We have seen every type of door problem possible and will provide you a free quote within minutes. We’ll fix your Aluminium & Glass Doors, Timber & Glass Doors, Balcony, Wardrobes and Internal Doors so you can slide them with one finger. Do not buy a new sliding door. Repairing a door will cost hundreds, whereas replacing a door can cost thousands. Your door will be fixed to the high standards we have established, as Adsafe Doors has been fixing doors in Sydney for 25 years. 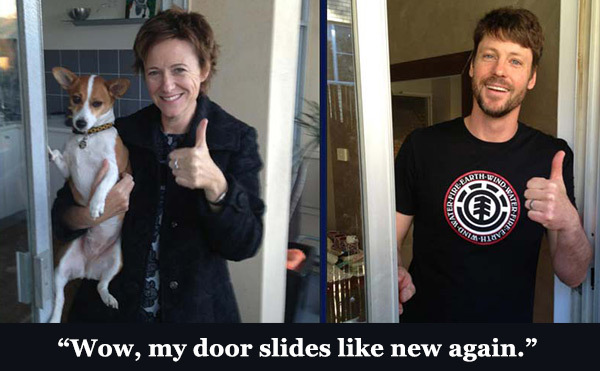 Adsafe has been the chosen sliding door repair company in Sydney since 1992. Over this time, we have been perfecting our sliding door repair process, and the combination of experience, quality and professionalism means your door will slide with ease. We have thousands of satisfied customers in Sydney and you will be dealing with licensed professionals. Click play on the YouTube video play button to watch us remove and install new tracks and rollers. You will see us fix a very jammed door so it slides like new and locks perfectly. You can see exactly how we operate and the care we take when fixing your sliding doors. Based in the Hills District, our team will come to you across the greater Sydney area. No matter if you live in The Hills District, North Sydney, Sydney City, Inner West, Northern Beaches, Upper or Lower North Shore, South Western Sydney, St George, Easter Suburbs, Kellyville, Parramatta, Cronulla or Canterbury area, we’ll arrange a convenient time and place to fix your door. Just a quick note to say I have just had the rollers replaced on 2 doors and was very impressed with both the quality of the work and the professional manor in which it was done. Well worth the money to have a proper job done and be left with a feeling of confidence in the work. You must watch these before and after videos of our many satisfied customers. Then give our team a call today on 0417 464 743 & we'll provide a solution to your door problem. Click play on the videos below. ﻿Six months ago our sliding door was “stuffed”, to put it crudely. Attempting to open or shut it challenged my limited strength and energy. (I am 80, my husband is 84 years old). After being repaired by Adsafe Doors, the change is remarkable. We can now open and shut the door with ease and I am constantly at the beck and call of ten cats and two dogs wanting to come in and out all day. (My dogs wanting to run around the yard, the cats limited to an enclosed back veranda so as not to raise the ire of neighbours). I can heartily recommend Adsafe Doors to anyone with a problem opening and shutting a sliding door. ﻿I cannot believe I was actually considering replacing my doors before finding Steven and the Adsafe team, he was prompt, friendly and professional. Took the time to explain to me the issue and give me a quote. He managed to fix my balcony that afternoon and I cannot believe the difference today. THEY SLIDE LIKE A DREAM! I used to have to put all my body weight behind the glass door to open it which was irritating and noisy, I can basically now open the door with one finger! Its incredible! Thanks so much Adsafe, you solved my issue competitively and successfully.